A Chitale, S Khubchandani. Interpretation Of Prostatic Biopsies: A Review. The Internet Journal of Urology. 2004 Volume 3 Number 1. The incidence of prostatic carcinoma is on the rise in the Indian subcontinent. A definitive diagnosis of this disease is obtained on a TRUS guided needle biopsy. Interpretation of these small biopsies therefore plays a vital role in the management and prognosis of the disease. However every investigation has its limitations. This review is intended to convey the complexities of biopsy interpretation with special emphasis on the problems encountered and need for clinicopathological correlation. Early detection of cancer is an important issue in the field of oncology. The prostate gland is no exception to this rule. The routine screening of the vulnerable elderly male population with the three pronged approach: digital rectal examination, transrectal ultrasound and estimation of PSA in serum has led to marked increase in the frequency of prostatic biopsies. This surveillance has given rise to detection of many patients with small sized cancers, considered ideal for radical prostatectomy. The pathologist is called upon to report on prostatic biopsy and it can pose many pitfalls in the accurate interpretation. Prostatitis, Benign prostatic hyperplasia and carcinoma cover almost the entire spectrum of prostatic diseases. Virtually all problems in the interpretation of prostatic biopsies pertain to an accurate diagnosis and grading of carcinoma of prostate. In chronic prostatitis, the inflammatory infiltrate may lead to distortion and atypia of the acini and this glandular abnormality may be misinterpreted as adenocarcinoma. Granulomatous Prostatitis is basically a histiocytic response to destruction of the glandular epithelium and consequent release of secretary products in the stroma. It has to be distinguished from tuberculosis. 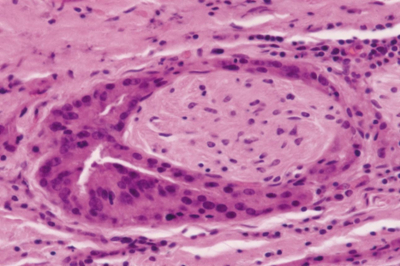 Squamous metaplasia is often seen near an infarct and this change has no precancerous role. It is mainly the architectural features that help accurate diagnosis of adenocarcinomas, particularly when it is well differentiated (Fig 1). In these cases, the presence of prominent nucleoli is a very dependable diagnostic criterion. One of the most common grading used is based on degree of nuclear anaplasia (nuclear grade 1,2 and 3 ) and glandular differentiation ( well, moderately and poorly differentiated ). The two parameters, individually or combined, have been found to provide a good prognostic index  and this system has been approved by the WHO. Gleason score 7a ( 3+4 ) has better prognosis that Gleason score 7b( 4+3 ). It was concluded that two tier Gleason system has more discriminating power in predicting prognosis of prostatic adenocarcinomas. 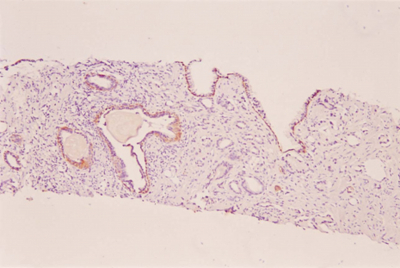 The histology report should comment upon lymphatic invasion. The latter consists of tumor cells within endothelium lined spaces and has been reported in 35% of radical prostatectomies. The presence of lymphatic invasion indicates extra prostatic extension, (62%) and lymph node metastasis in many cases, (67%). Perineural lymphatic invasion ( Fig 5 ) is a mechanism by which the cancer spreads in periprostatic soft tissues. This has been reported in 38% to 93% of cases of radical prostatectomies. . In a few problematic cases, perineural invasion may be the sole diagnostic criteria but unfortunately it is encountered in as low as 4.7% of prostatic biopsies (Table III ) . The presence of blue glandular mucin has been described as a useful parameter although some believe that it is a non-specific finding. 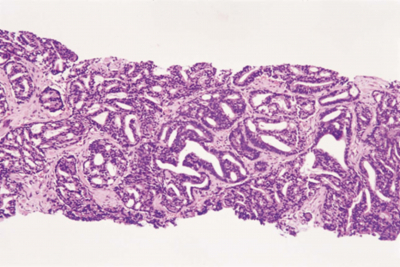 Crystalloids, sharp needle like eosinophilic structures and collagenous micronodules are a specific but infrequent finding in prostatic adenocarcinoma. and we have not encountered any case with these morphological features ( Table III ). 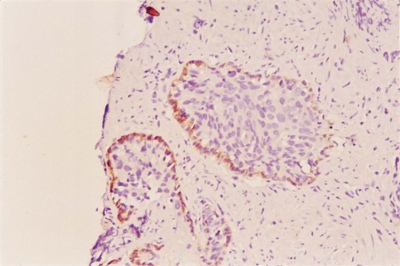 Immunostaining for high molecular weight keratin is very useful in biopsies suspicious of adenocarcinoma. 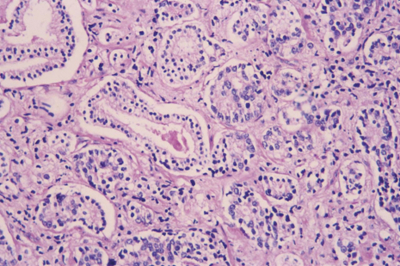 It specifically stains basal cells that are present in normal glands and not seen in carcinoma. 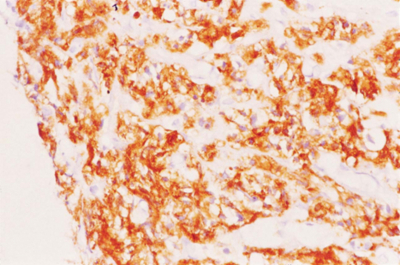 In foci suspicious of carcinoma, demonstration of absence of basal cells ( Fig 6 ) by this stain is diagnostic of adenocarcinoma. In 56% of cases of high grade prostatic intra epithelial neoplasm (PIN) the basal layer is only disrupted but not lacking ( Fig 7 ) . Immunostaining for PSA and PAP is helpful to confirm the prostatic origin of a metastatic adenocarcinoma ( Fig 8 ) and to distinguish between transitional cell carcinoma and prostatic adenocarcinoma in some situations. 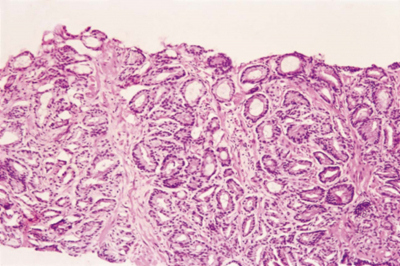 Prostatic intraepithelial neoplasia (PIN) is a concept borrowed from the well established and universally accepted term cervical intraepithelial neoplasia. PIN is considered to be the most likely precursor of invasive carcinoma. It is characterized by cellular proliferation within preexisting ducts and glands with cytologic atypical changes bordering on carcinoma (Fig 9) . The precancerous changes were described as mild, moderate and severe dysplasia but currently the moderate and severe grades are combined and referred to as high grade PIN. Mild dysplasia ( low grade PIN ) is considered clinically insignificant because progression to higher grade has not been reported. PIN coexists with cancer in more than 85% of cases. High grade PIN in biopsies generally predicts the presence of cancer in subsequent biopsies. If a biopsy reveals only pure PIN then the patient has to be subjected to repeat biopsies and kept under surveillance. PIN is least likely to be encountered in transurethral resections because 86% of PIN occurs in the peripheral zone. However, the mean incidence of finding PIN in needle biopsies is only 5% to 6%. The precancerous role of PIN is not universally accepted Harvei et al  believe that there is still lack of proof that PIN is a true premalignant lesion. We reviewed 64 cases of prostatic adenocarcinoma on needle biopsy and found PIN in only 7 cases. No instance of PIN was encountered in noncancerous prostatic biopsies. In some biopsies, there is a localized proliferation of small acini that is suspicious for carcinoma but falls just below the diagnostic threshold. The reported incidence is 1.5% to 9% of prostatic biopsies in unselected series' . The problem is caused by the small size of the focus and may represent a minimal volume prostatic adenocarcinoma, defined as involving less than 5% of the biopsy tissue. Serial sections need to be studied, as some investigators have shown that the diagnostic yield of additional sections revealed definitive carcinoma in 10% to 36% of cases . Iczkowski and others  proposed the term atypical small acinar proliferation. All these patients diagnosed as having small acinar proliferation should be subjected to a repeat biopsy. The likelihood of prostatic cancer on subsequent biopsy in cases with initial suspicious lesion varied from 21%-49% [9, 11,12,13,14] in different series'. Allen et al reported that cancer was identified on re-biopsy at the same sextant site as the initial atypical biopsy in 48%. Epstein (1995) reviewed 434 prostatic biopsies referred to him for diagnostic problems . He described many parameters other than architecture and presence of nucleoli, which are helpful for a definitive diagnosis. Adenosis or atypical adenomatous hyperplasia is a benign condition superficially resembling carcinoma. It is commonly found in TUR prostate samples and prostatectomies. It is rarely encountered in biopsies, because the lesion typically occurs in the transitional zone. Basal cell hyperplasia consists of a proliferation of basal cells in two or more layers near the basement membrane (Fig 10) of the prostate acini. 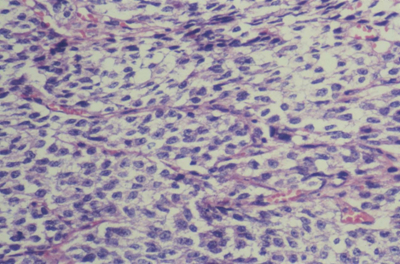 The cells are immunoreactive for high molecular keratin (34BetaE12 keratin) and this will distinguish the lesion from adenocarcinoma. Other conditions with basal cell proliferation include basal cell adenoma and adenoid basal cell carcinoma , both rather rare. 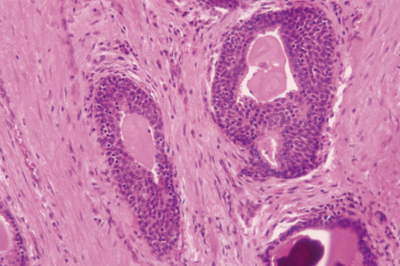 Some rare types of carcinomas detected in the prostate include ductal adenocarcinoma (“endometrioid” carcinoma) mucinous adenocarcinoma and small cell carcinoma. All these are aggressive tumours in comparison to the conventional adenocarcinoma. A few may respond to hormonal manipulation. Transitional cell carcinomas are also seen in prostatic biopsies but often represent an extension of primary in urinary bladder. 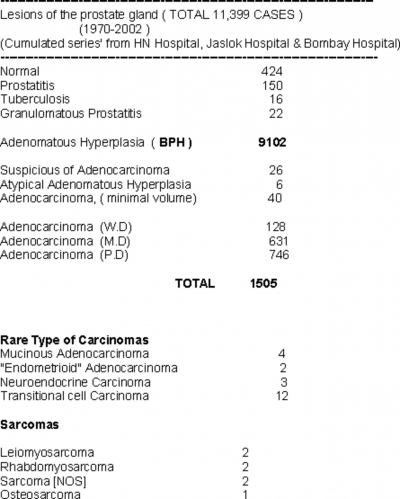 Sarcoma of prostate is very rare. Sextan et al  reported 21 cases of adult prostate sarcoma and found leiomyosarcoma in 12 and rhabdomyosarcoma in 4. Sarcomas in children are mostly rhabdomyosarcomas. In our series ( Table VI ) of 7 cases there was one osteosarcoma, an almost anecdotal occurrence. In our series, WHO grading system was employed in cases of prostatic carcinomas as of 1996. Table V gives the incidence of various grades according to gleason's system in both transrectal biopsies and TUR specimens. USG guided sextant biopsy is now a standard procedure in patients suspected to harbor prostatic cancer. However, the clinician is often faced with a problem of negative needle biopsy in patients having persistent elevated PSA or abnormal rectal digital examination. False negative findings occur in 19% to 23% of initial biopsies in patients with abnormal rectal examination and persistent PSA elevation. In one series dealing with this issue, the repeat sextant biopsy was positive in 19% of cases . Seminal vesicle biopsy is reportedly of value in patients with PSA above 15 and or abnormal seminal vesicles seen on USG. Some urologists routinely advocate a seminal vesicle biopsy for a more realistic assessment of extent of prostate cancer. The yield of seminal vesicle biopsy is approximately 15% in patients with biopsy proven clinically localized cancer and 69% in patients with metastases . The interval at which a biopsy should be repeated may be debatable but Epstein and Potter  have recommended an interval of 3 months following the first biopsy. There are studies correlating needle biopsy Gleason score with the Gleason score on study of radical prostatectomy specimens . In one large series, Gleason score of 5-6 on biopsy corresponded to the same grade in the radical prostatectomy in only 64% cases and for scores of 7 or greater on biopsy the agreement was in 88% of cases. Thus, adverse findings on biopsy accurately predict adverse findings on radical specimen. However, it is accepted that Gleason's score is a powerful predictor of prognosis and an important part of histopathology report. 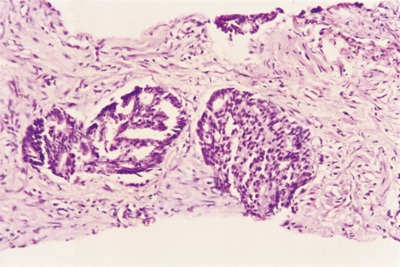 This assessment may be useful to differentiate organ-confined cancer from one, which has extended beyond the prostate. There are four different ways of assessing the volume of cancer: (1) percentage of biopsy cores involved; (2) percentage of cancer area in each biopsy specimen; (3) millimeters of adenocarcinoma in the entire biopsy; (4) millimeters of adenocarcinoma per core. The most commonly used method is to calculate the percentage of cancer area in all biopsy fragments. It is known that a small volume (0.5 cc) of low grade cancer found on needle biopsy may have no potential for progression (clinically insignificant). Some urologists believe that no surgical or hormonal treatment is required in these cases and the patients are to be followed with periodic PSA estimation, DRE and TRUS. How does one differentiate this from the clinically significant cancer? It is easy to assess the tumour volume in TUR samples or radical prostatectomies. However, we believe that, the distinction between clinically significant and clinically insignificant cancer cannot be made on mere biopsy study. Patients with diploid tumours have a more favorable outcome compared to patients with aneuploid tumours. Most low stage tumors are diploid and most high stage tumours non-diploid, but exceptions abound. We wish to thank Dr. S.S. Joshi, Consultant Urologist, Jaslok Hospital & Research Centre for his valuable suggestions. 15. Devraj LT, Bostwick DG. Atypical basal cell hyperplasia of the prostate.